All About Bags - Paper Versus Plastic Bags - Which is More Environmentally Friendly? Fiction: Many believe that paper bags are more environmentally friendly than plastic bags because they are made from a renewable resource, can biodegrade, and are recyclable. Fact: Plastic shopping bags outperform paper bags environmentally – on manufacturing, on reuse, and on solid waste volume and generation. The belief that paper is better than plastic is not based on science or fact. It is based on misconceptions about how plastic bags are made, how landfills work, the incidence of plastic litter, and that non-biodegrading products are bad for the planet. Numerous life cycle assessments demonstrate that conventional plastic bags are better for the environment than paper bags. On resource use: plastic bags play an important role in the conservation of the natural gas resources. In Canada plastic bags are made from ethane which is often burned off in the natural gas refining process. On manufacturing: paper bag manufacture is much more resource-intensive than plastic bag manufacture. On reuse: it is difficult to reuse paper bags because they tend to tear. On solid waste: paper bags have much greater mass and weigh five to seven times more than plastic bags so they add five to seven times more tonnage to the waste stream for municipalities to manage. This in turn results in a fivefold to sevenfold increase in greenhouse gas emissions. Every bag, paper, plastic or reusable, has an environmental impact. The debate over the comparative environmental impacts of paper versus plastic bags has led to a number of life cycle assessment (LCA) studies in Europe and North America (see section on Studies). The findings of these LCAs support the fact that plastic bags have a smaller environmental impact than paper bags and that plastic bags are a better environmental solution than paper. Paper bags have a much higher global warming potential (GWP). The manufacture of paper bags is much more resource intensive than plastic consuming larger amounts of energy and water. See below, or the section next section, Paper versus Plastic—The Studies. Post-consumer recycled paper used to carry heavy items is problematic. 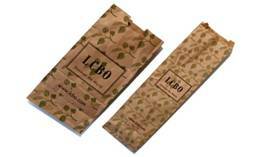 The Liquor Board of Ontario (LCBO) switched to paper bags. They started with 100% recycled paper content but have since discovered that the bags did not perform well, so the recycled paper content was modified. The four bottle bag is made from virgin paper to carry heavy loads. The one and two bottle bags, which carry very little weight, are made with 35-40% recycled paper content. Plastic bags were invented as an alternative to paper grocery bags in the late 1970s to protect trees and prevent clear-cutting of our forests. Plastic bags are a by-product of natural gas extraction and provide an environmental solution to the burn off of this gas during the refining process. The polyethylene material used for conventional plastic shopping bags is made from ethane, which is the strand of natural gas that is burned off during the refining process to lower the BTU value of the gas so that the gas does not burn too hot (so it can be used as fuel in our homes). Essentially, the strand of ethane gas is conserved, captured and frozen before it can be burned off into the atmosphere. Life Cycle Assessments (LCA’s) show that the manufacture of paper grocery bags has a heavier environmental impact than the manufacture of plastic shopping bags. According to the Scottish government's 2005 Report on Plastic Shopping Bags, the manufacture of paper bags consumes four times more water than the manufacture of plastic bags and paper generates three times more greenhouse gases. The EcoBilan Carrefour Life Cycle Assessment shows that in their manufacture, paper bags consume 2.2 times more non-renewable energy than the manufacture of plastic bags; paper bag manufacture consumes 4.7 times more water, emits 3.1 more greenhouse gases and 2.7 times more acid gases than the manufacture of plastic bags. Each study discloses slight differences in results, but all studies agree that paper bags carry a substantial environmental impact in their manufacture that is not seen with plastic bags. See the section on Plastic versus Paper – The Studies for more detail. Whatever type of bag is used, the key to reducing its environmental impact is to reuse it as many times as possible. Paper bags tend to fail on reuse because they tear easily and are not waterproof. Conventional plastic bags are highly reusable and outperform paper. They are reused as carry bags and as kitchen catchers for garbage and organics, among their many uses. The Ontario Ministry of the Environment audit data that tracks the province’s 50% bag reduction program shows a 59.1% alternate rate for plastic shopping bags. The 2011 LCA by the UK Environment Agency identified a reuse rate of 40.3%. The most significant and immediate impact of a switch from plastic shopping bags to paper grocery bags is the additional volume and tonnage that paper adds to the waste stream. This additional volume correlates directly to significant increases in the amount of greenhouse gases emissions produced to transport it. Paper grocery bags are heavier than plastic bags. 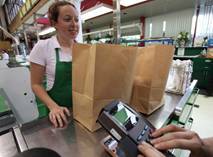 The typical plastic shopping bag weighs 6-8 grams; a standard Kraft paper bag weighs 55 grams. This leads to additional waste, waste management and recycling costs. It takes seven trucks to transport two million paper bags, versus one truck to carry two million plastic bags. The differences between paper and plastic strongly supports why bans don't work. In 2006, Taiwan rescinded a ban on plastic bags in their fast food sector. The ban led to an increase in the use of paper bags with a resulting massive increase in tonnage, waste management costs and greenhouse gas emissions. Paper bags tend to have higher recycling rates than plastic bags. Canada has, over the past decade and half, developed a highly effective network of plastic bag recyclers across the country – large and small. Some of the larger players are Merlin Plastics in B.C. and Alberta; EFS in Ontario; Gaudreau Environment; and Inteplast in Atlantic Canada. Recycling rates of plastic bags in Canada are high. The Ontario Ministry of the Environment's 2010 report on the 50% Plastic Bag Reduction Program determined a 36% recycling rate in municipalities recovering bags in the blue box. In B.C. and Alberta over 30% of the bags are recycled. In Quebec, 33% of all plastic shopping bags are recycled. And in Atlantic Canada, which pioneered bag to bag recycling systems working with large grocery retailers, rates are higher: 50% in NS and 57% in PEI.